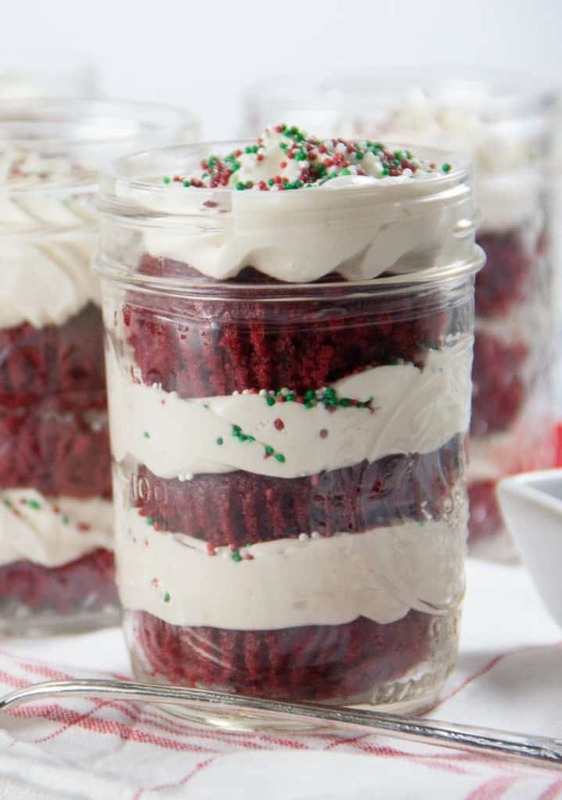 This red velvet cake in a jar recipe is easy to make and even easier to transport! They have a creamy cheese frosting in a fun mason jar- add sprinkles to make them super festive! 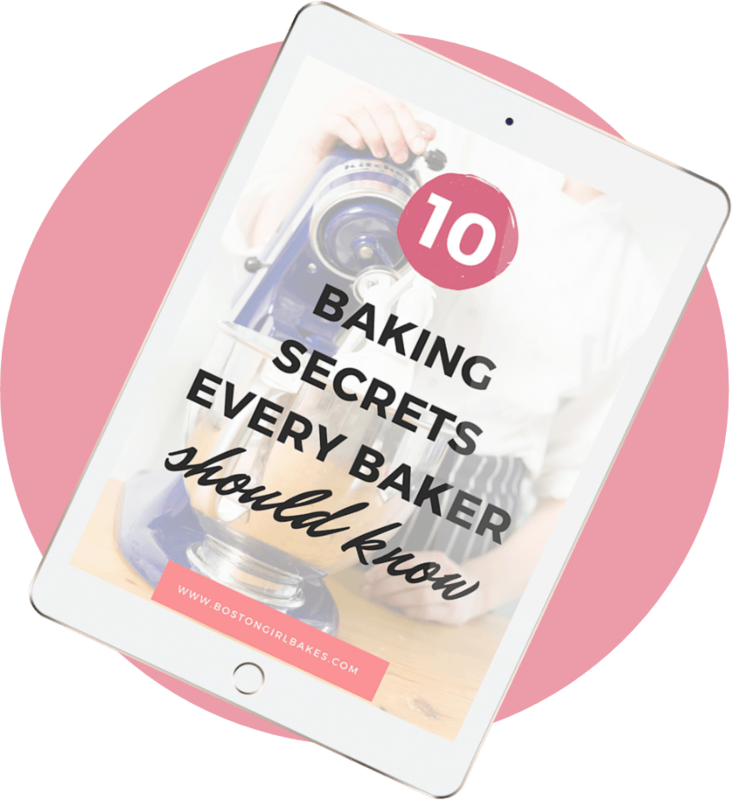 When it comes to bringing scratch made desserts to get togethers, sometimes it can be downright stressful. Traveling with those desserts, wondering if they will still look the same way you made them and carried them out of your house. I’ve tried my fair share of cupcake holders too and only be disappointed. Red Velvet Cake In A Jar. A jar cake, or mason jar cupcakes (whatever you call them!) 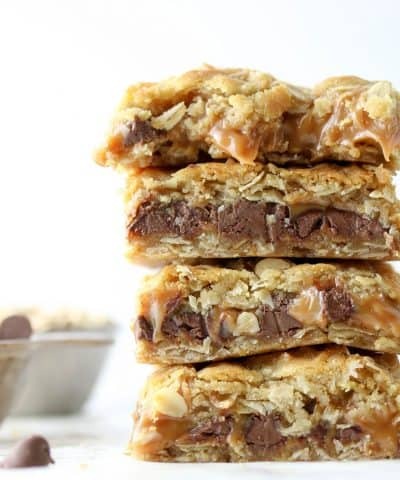 are a genius way to enjoy your dessert. 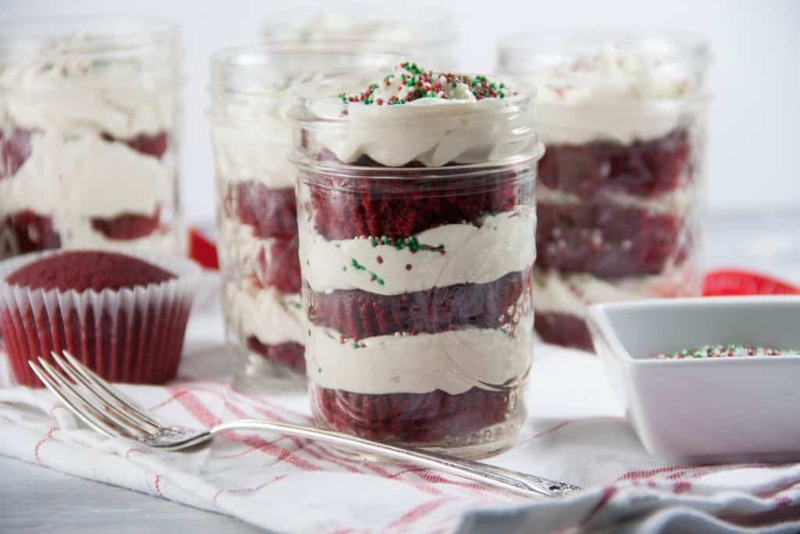 You layer the red velvet cake with the frosting into cute mason jars. I baked mine as cupcakes so they were a perfect fit. You just need to cut them in half and layer with your frosting. I mean cake and frosting on repeat? Yes please. Are Red Velvet Cupcakes Just Chocolate? If you are somehow unfamiliar with red velvet let me drop some quick knowledge on you. It is a buttermilk based cupcake with a hint of cocoa, and of course red food coloring added in. Here is a fun fact for you from Cheesecake.com according to history, during World War II, because foods were being rationed bakers used boiled beets to enhance the color of their cakes and also to help retain moisture. It wasn’t until the 1920s, that a man was trying to sell more vanilla extract and food dye that the supposed original Red Velvet Cake was born. Huh, who knew? And I know some people shy away from the food coloring and still prefer to use the beet method. No beets for me please. I’ll save the beets for my salad. Start by preheating your oven to 350° F. Then prepare your cupcake pans by either placing cupcake liners in them or spray with a non-stick spray. Then go ahead and make the batter. This is an easy one bowl recipe. These are my red velvet cupcake recipe that I used for these mason jar cupcakes. Don’t you just love that?! 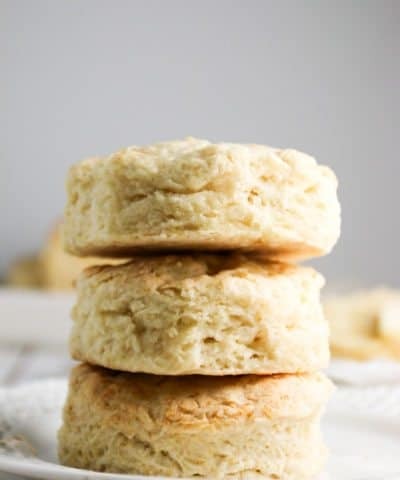 In fact, this is a recipe I will show you how to make and the science behind it, and so many more in my Ultimate Baking Bootcamp class. 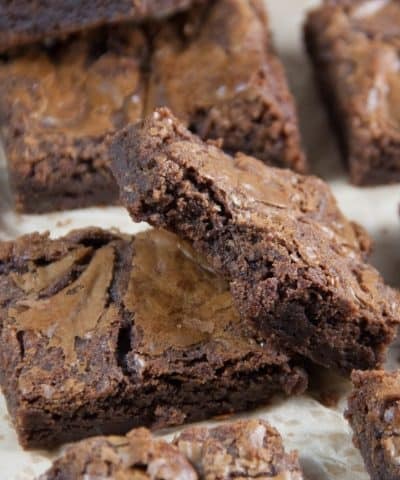 In a medium bowl, combine the cake flour, sugar, baking soda, cocoa powder and salt; whisk to blend. Then whisk in the eggs, vegetable oil, buttermilk, food coloring, vanilla and vinegar until all combined. Then divide the batter evenly between the prepared liners. Bake, rotating the pans halfway through baking, until a toothpick inserted in the center comes out clean, about 18 minutes. Let cool in the pans 5-10 minutes, then transfer to a wire rack to cool completely. 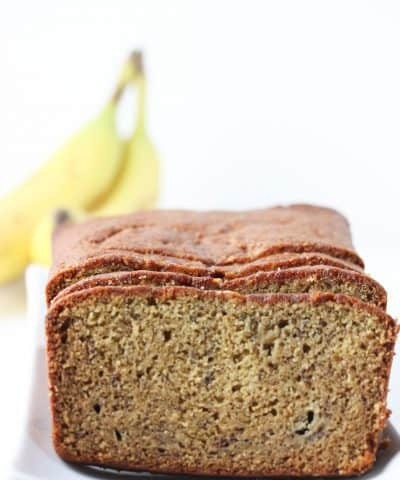 If you don’t have any cake flour you can learn how to make your own cake flour here. Have your pans ready before you start. 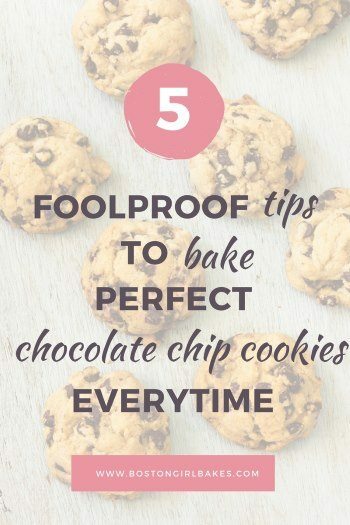 Because these are going in mason jars in the end, you could skip the cupcake liners and simply spray your pans generously with a non-stick spray. These are my go to cupcake pans right now that I am baking with. Combine your dry ingredients in one bowl and then simply add in your wet ingredients. This is a great one bowl recipe! 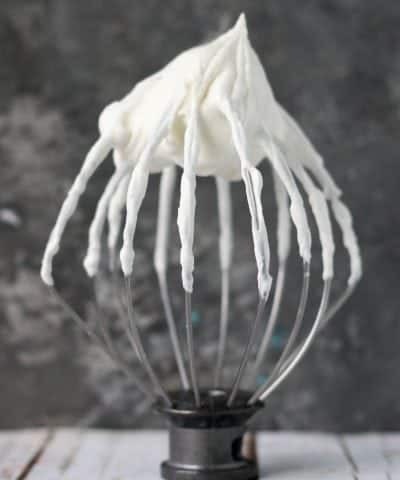 Use COLD cream cheese for your frosting. It will take a little longer to whip up but holds up better. But if you don’t want to bust out that mixer, then soften that cream cheese and then mix by hand. Allow the cupcakes to cool fully and then remove the paper liners if you used them. 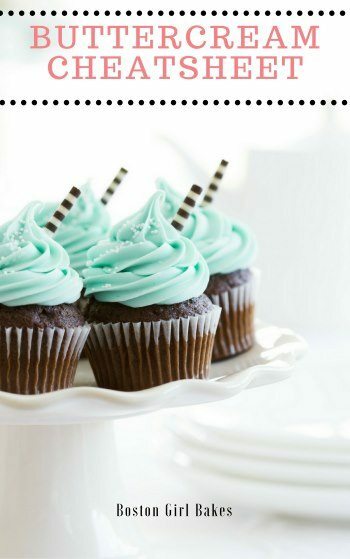 If your cupcakes are small you can layer a cupcake, frosting, and repeat. For me my cupcakes were a little large so I cut them in half. I used this size for the mason jars. Each jar then got- cupcake, frosting, cupcake, frosting, cupcake frosting. Each jar holds 1 1/2 cupcakes. How Long Are Cakes In A Jar Good For? I think my favorite part of mason jar cupcakes is that they last longer. These mason jar cupcakes will be last 7-10 days. And you can also freeze them for up to 6 months! 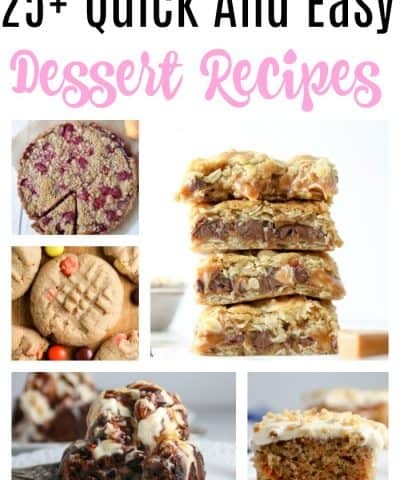 If you are travelling for the holidays or a get together, these desserts are exactly what you need in your life. Just simply pop the top on these and then you don’t have to worry about how they will look when you arrive to where you are getting to. I’ve made these Eggnog cupcakes in a jar as well for a perfect go to dessert to take to parties as well! So let’s enjoy the holidays and stress no more, shall we? 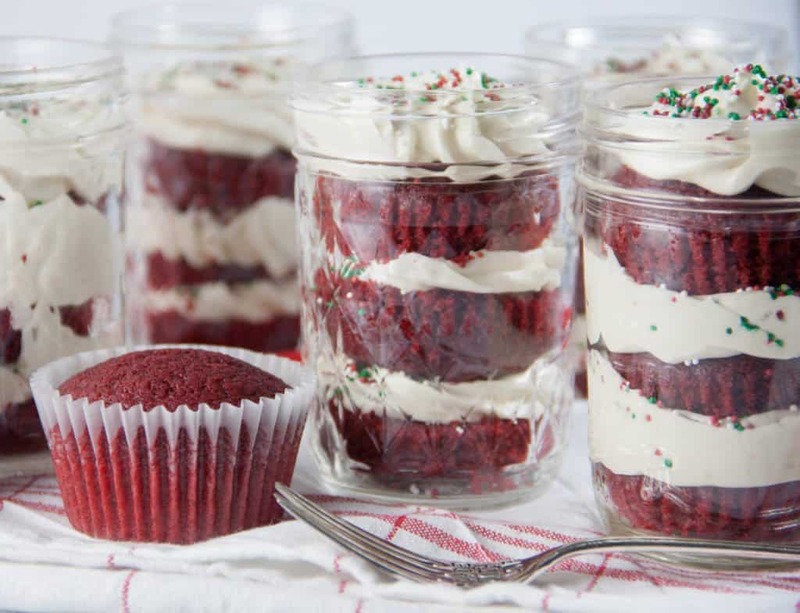 Grab some mason jars and whip up these red velvet cupcakes. Pop the top on and drive in peace. Listed below are the items you need to make these cupcakes in a jar. They are affiliate links, so you will be re-directed to Amazon. I do receive a small commission if you make a purchase, but it costs you nothing extra! Thank you in advance! 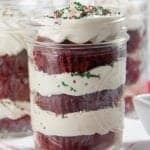 Fluffy red velvet cupcakes with perfectly sweet and slightly tangy cream cheese frosting all layered in mason jars! Preheat the oven to 350° F. Line cupcake pans with paper liners or spray generously with a non-stick spray. Then whisk in the eggs, vegetable oil, buttermilk, food coloring, vanilla and vinegar until well blended. To make the frosting, combine the cream cheese and butter in the bowl of an electric mixer. Beat on medium-high speed until well combined and smooth, about 2-3 minutes. Mix in the vanilla extract. Gradually beat in the confectioners’ sugar until totally incorporated, increase the speed and then beat until smooth. Once cupcakes are cooled, cut them in half. 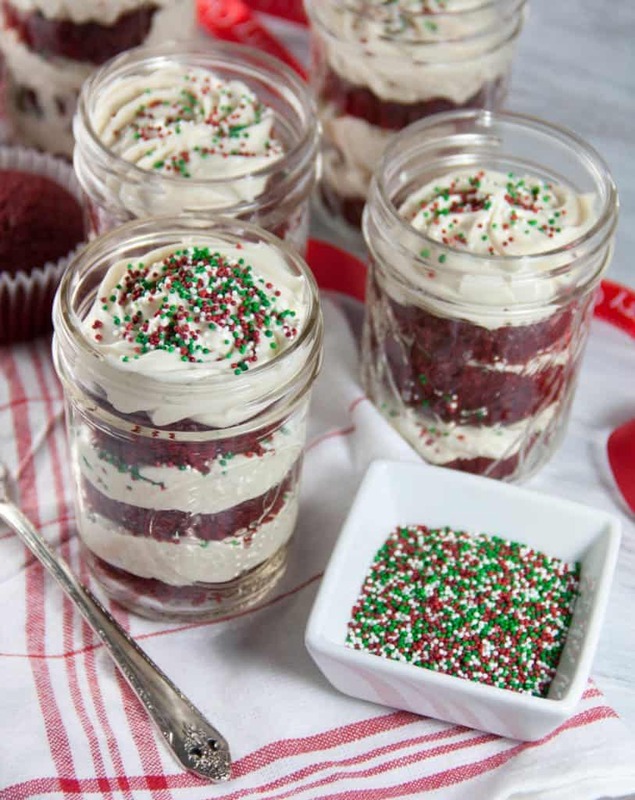 Layer in the mason jars, with half a cupcake, frosting, then repeat twice. Use COLD cream cheese for your frosting. It will take a little longer to whip up but holds up better. But if you don't want to bust out that mixer, then soften that cream cheese and then mix by hand. 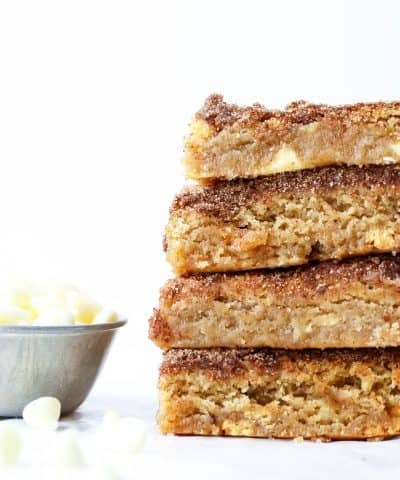 I’m totally going to attempt to make these! They would make a perfect gift too! 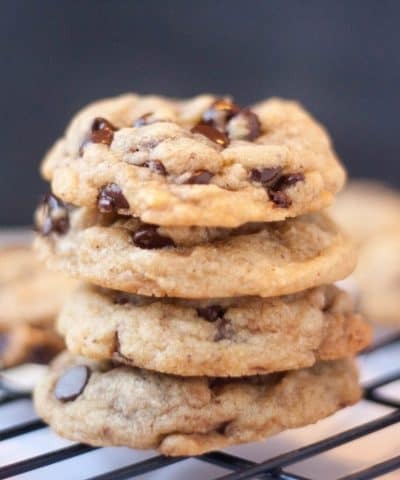 Oh my god, I need to make these so bad! I love red velvet and the jars make them even etter! 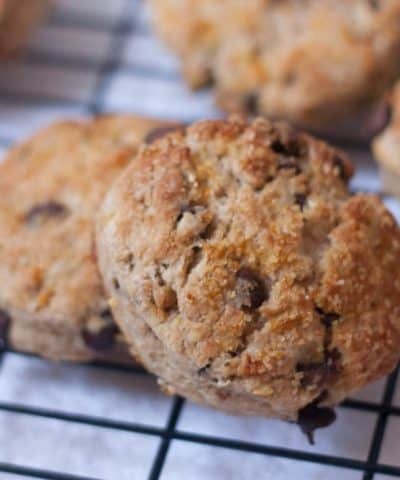 These look so incredibly yummy and easy to create. I will definitely be trying this out. I’m off to buy mason jars right now! You’re going to love them Cynthia! 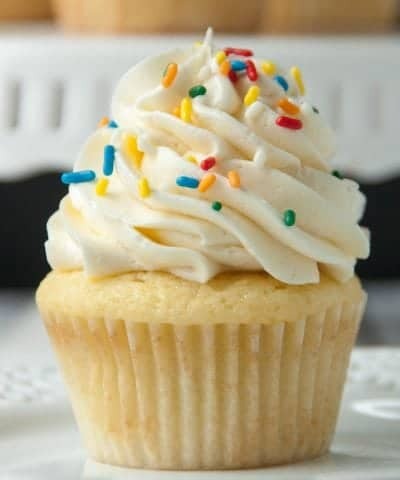 I mean you get more frosting in a bite than if it was a regular cupcake..so UM YEA need I say more? These look absolutely wonderful. I should definitely try to make these!